Documents and files are things that should always be kept safely in correct location on right computer or drives. System corruption or human error may delete files by accident, and the deletion of significant may give rise to awful effect, trouble or disaster. The loss of precious data is annoying and can spoils a perfect day, which also might cost a large sum of money to make up the loss. Sometimes, lost files can never be redone, such as video, audio and photos files. Memorable moments can’t be recreated, which is captured by camera clip. This is the major reason to undelete files. It is essential to be composed and carry on thoughtful approaches. First check the Recycle Bin. If you haven’t emptied it then deleted files are supposed to be in there. And you can easily undelete and restore them to original location. Windows is equipped with Recycle Bin to restore data, so you should make a second check before empty it. If files have been deleted from Recycle, you need to check all of your backup locations for those files. If you have the recent backup copy, then deleted files still can be restored easily from the backup copy. Thus, it is quite important to keep updating backup files. You are still able to restore deleted files after they are permanently deleted. I’ve explained the reason in detail, and I’m not going to illustrate it all over again, please check former articles. To undelete files you are in need of help of file recovery software-Eassos Recovery. You can download it from the Internet and try it for free. This software is created with multiple features of recovering data that Windows doesn’t possess. It enables you to recover deleted files and restore files from formatted drive. Note that you should start recovery course before files get overwritten. 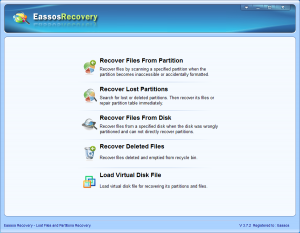 Eassos Recovery makes use of deep scanning solution when searching for deleted files and folders. It promises the best chance of successful recovery. The file preview function permits you view what you are going to recover and learn file quality before complete recovery task. 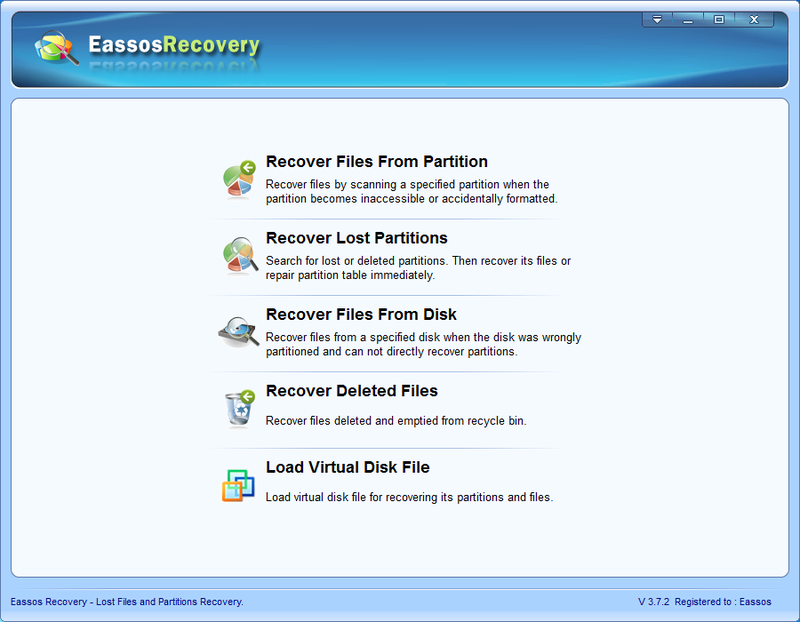 Above all, Eassos Recovery should be downloaded and installed first. Note: this step mustn’t be done to the partition which is going to recover data. Step 1, Run the program and choose correct feature. Step 2, Fine scanning. Click the partition which is about to retrieve data and click “Next” button. Step 3, Preview and recovery. Preview recoverable files and get them recovered. This entry was posted in Data Recovery and tagged Android mobile phone data recovery, file recovery software, undelete files by EASSOS. Bookmark the permalink.